» Weight Limit On Trampoline: How Much Weight Can a Trampoline Hold? Nowadays, trampolines are becoming quite common in most homes. However lots of people have always wondered how much weight can a trampoline hold. Reason being not long ago, it was an equipment meant for children, and whenever you went to any kids party, it would be present but with a large notice by its side which indicates that adults or people who have passed a particular weight limit should not use it. Nevertheless, times have changed, and now there are trampolines for both adults and kids. What is yet to change is the weight limit tag as even the adult ones still have it. That often leaves most people wondering why trampolines have weight limits when all you need to do is bounce. If you are in that category of people who question that, then read on to get your answer and even more information regarding the weight limit on trampoline. How much weight can be on a Springfree trampoline? Can you go over the weight limit on a trampoline? Most people always end up concluding that it is all about breaking when in fact it is the complete opposite and if so, why do trampolines have weight limits? It is all about the structure and the operation of the unit itself. The materials used to make it should be able to return the downward force with an equal upward force whenever anyone is using it, and as a result, the structure of a tramp includes springs for this function. If a dense spring material is used to make a trampoline meant for a lightweight person, then they will not be able to enjoy because the downward force they generate while jumping on it is not enough to produce an equivalent upward force. If a heavyweight person uses the same trampoline, then they will enjoy because they can generate enough downward force on the spring and as a result, it returns an equal upward force. The same case applies to a trampoline meant for a lightweight person, and if a heavyweight person uses a tramp which exceeds his weight, then chances are that it will bottom out because the downward force placed on it is too much for the springs to return an equivalent upward force. And that is the reason why trampolines will always have weight limits because it is all about the quality of the bounce you get when you are on it. In addition, it is also about the safety of the user. You don’t want to end up having accidents instead of fun so before making any purchase, always ensure you ponder over the question, how much weight can a trampoline hold. 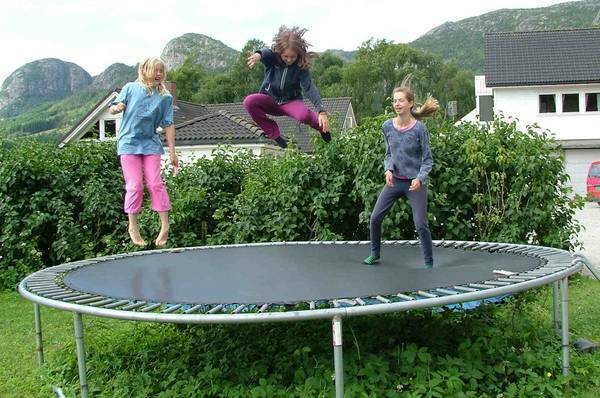 There are plenty of factors which are used in determining the weight limit on a trampoline and topping the list is the materials used to make it and this case, the springs are the first materials which matter because without them there is no trampoline. They are the ones which create the bouncy impact, and thanks to that, they directly affect the weight limit. If a tramp has lightweight springs, then it will suit someone who is not heavy better, and if it has heavy duty springs, then chances are that it was made for a bulky person because the springs will require a weightier person to stretch. Another material used in determination of the weight limit is the jumping mat. The way they are woven and the type of material they are made of also plays an essential role in accommodating people of different weights. Most tramps have materials such as woven polypropylene or waterproof canvas and a tramp made for a light person will have less stitching rows than one meant for a burly individual so it can work together with the springs to accommodate the user. Normally, the jumping pads are available in different sizes which fit your needs depending on the available space. Most importantly, they are easy to install and provide maximum pleasure for your kids. Lastly the material of the structure and the way it is designed also have a role in determining the weight limit on the tramp. 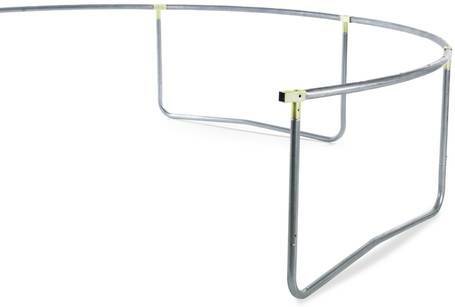 For instance, you will find that most heavyweight tramps have thick gauge steel for maximum stability and also to prevent them from buckling when the user is on it, while a tramp made for a lighter person will have less thick steel on its frame because it can easily withstand the weight of the person. However, it is essential to note that manufacturers impose weight limits on trampolines for your safety because falling off a trampoline is an accident no one wants. Durability is another thing they usually have in mind because no one wants to keep on purchasing the same thing more than once or twice. When you buy a tramp meant for your weight limit and those of the people around you then chances are you are not buying another one soon because it will accommodate you and your loved ones for years on end. Nonetheless, if you buy one which does not suit you, then chances are it will bottom out sooner than you thought. Besides the materials, the size also helps in determining the answer on how much weight can trampolines hold? Below is more insight on that. Typically and as the name suggests, they are the smaller models, and hence they are meant for toddlers only. Most of them are between the age group of three to ten years and usually weigh 100 pounds or less, and as such, most of the toddler tramps often have a weight limit of between 75 to 150 pounds. Most of them measure 8 feet and are more suitable for toddlers because they are lower on the ground and have handrails for the safety of the child. They will also fit in a small backyard well without occupying too much space. Besides 8 feet, a trampoline measuring 9 to 10 feet will accommodate toddlers. Therefore the weight limit on an 8 feet trampoline has a weight limit of 150 pounds or below. 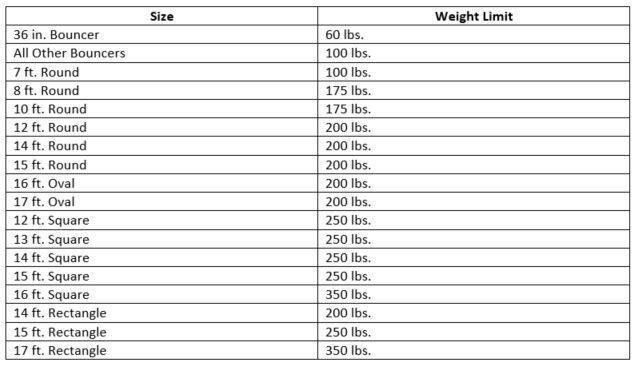 Below are the recommended weight limits suitable for a big backyard. 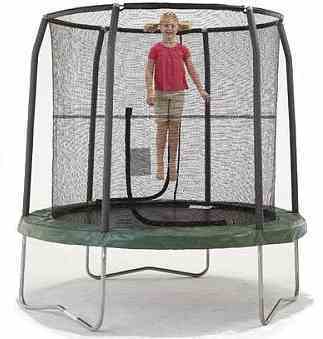 The 12 foot trampoline weight limit is around 250 to 300 pounds. The weight limit on a 14 foot trampoline is usually 250 to 350 pounds. The weight limit on a 15 foot trampoline is usually 250 to 450 pounds. Nevertheless, it is important to note that the style also affects the weight limit. Now that you know the different weight limits imposed by size, it would only be fair if we make you aware of the weight limit on trampolines by style and also different brands. The design of the trampoline dramatically influences the weight limit. Currently, the most common ones in the market are the rectangular trampolines and rounded trampolines, and they also impact the weight limit. The most popular size of a rectangular one is 6 by 12 feet, and most of them have a weight limit of about 450 lbs. In addition, they can hold more weight than their rounded counterparts. Round trampolines usually measure 14 feet and have a weight limit of 400 pounds. Thus it all depends on your preferences. Springfree is one of the best﻿ ﻿trampoline brands whose tramps have flexible composite rods in place of the springs. Springfree has been on the market for quite some time now, and just like any other tramp company, its products usually have weight limits. However, they have different sizes ranging from the smallest ones for kids to big ones, and the maximum user weight that a Springfree trampoline can accommodate is 330 lbs, which is an equivalent of 150 kg hence suitable for heavyweight people. Different brands have their way of determining the weight on a trampoline, and Skywalker uses the ASTM. However, that is a discussion for another day. 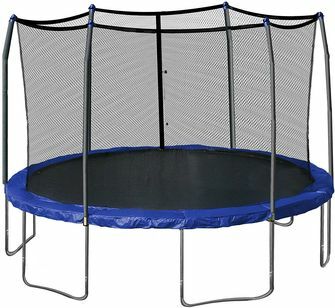 Similar to other brands in the market, Skywalker has different trampoline sizes from the ones which accommodate toddlers to the big ones. The most weight that can be on a Skywalker tramp is 350 lbs. And it is rectangular and has a measurement of 17 feet. It is not all about the weight limit because even the trampoline itself has its weight which you might want to consider while buying one depending on the surface you want to place it on. Although its weight varies depending on the brand and also the weight capacity it is supposed to hold, the average weight of a trampoline is between 200 to 350 pounds. When it comes to enjoyment, we all want our children to have the best. Even though we can do anything to see them happy, don’t let the love for enjoyment supersede the love you have for your child. Ensure that trampoline safety tips are on your mind to provide your child with both enjoyment and safety. The best way to be on the safe side of a trampoline is always to ensure you follow the recommendations given by the manufacturer on the weight limit. If the manual states that it can only accommodate toddlers weighing 150 pounds do not go jumping on it and you are more than that because if you do, chances are it will tear and also leave you with injuries. Also test for any signs of weaknesses before using for instance, by jumping lightly, or if there are any parts which look like they have incomplete stitching, it is vital that you return it to the manufacturer. It’s also important to note that children under the age of five years are not allowed on the trampoline, and don’t allow more than one person to jump simultaneously. Last but not least, no one is allowed on the trampoline with jewelry or other sharp objects, and therefore, inspect your children before allowing them to jump. If you want some tips on finding the safest trampoline visit our guide. Research has it that more than 70% of trampoline injuries happen thanks to the lack of an enclosure. Therefore be on the safe side and go for one that has a net enclosure as it keeps you from jumping too close to the edge and as a result chances of you bouncing off the tramp are eliminated. For installment, choose a soft surface area such as grass and also ensure that it is even. Placing it on an uneven ground may cause it to be unable to support your weight while putting it on a hard surface such as your home's floor may cause stress to the frame and hence chances are it will not last very long. Install it in a safety perimeter free from fence poles, trees and walls, as they may inflict injuries to your children when they jump too high. Also visit our how to set up a trampoline and how long does it take guides for more tips. Lastly, buy from a trampoline brand that has a good reputation, and that can be trusted. Some upcoming companies will use false advertisements just to get you to buy their tramps so ensure that the brand you are buying from can be trusted. Trampolines have so many benefits that you cannot afford to miss out on. From offering you a fun way to exercise to help your kids develop an active lifestyle, trampolines are the best fun equipment that you can have in your home. Nevertheless, before you make any purchase ensure you are aware of how much weight can a trampoline hold? By considering that aspect you will be in a better position to get one that suits not only your weight but also one that has the right materials for durability purposes.